The 18-year-old newcomer has been successfully modelling for Calvin Klein, Armani, Marc Jacobs campaigns and many more labels for over five years now, but turned down cover shootings to attend theatre castings. This is where she was discovered - on stage of a school theatre in Brussels: She embodied precisely the "ethereal" atmosphere that was so important for the development of the character. Jon is a young British-Japanese based in London. Besides modelling, he has acted for commercials and music videos. 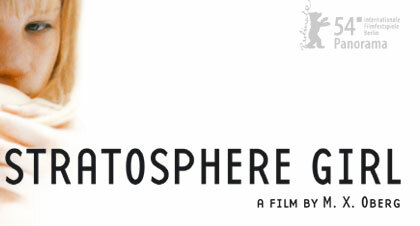 With "The Stratosphere Girl", he has begun shifting his focus o theatrical and television films. Though young in years, Rebecca Palmer has already established a solid reputation for herself in her native England and abroad, in particular for her performance in Patrice Chéreau's "Intimacy." She obtained her training in film, television and theater at Bristol University. In addition to her career as a stage performer, she has appeared in a number of television productions and feature films alongside Kate Winslet, Geoffrey Rush and Michael Caine ("Quills"), Joseph Fiennes and Heather Graham ("Killing Me Softly") and Emmanuelle Béart ("Likeness in Stone"). One of Sweden's most popular young actresses, Tuva Novotny is known above all for her lead role in the international success "Jalla! Jalla!". Her other Swedish film credits include "Slim Sussie" (dir. U. Malmros), "MIDSOMMER" (dir. K. Myllerup), "Kommer Du Med Mig Då?" (dir. K. Grede). She was selected as one of the European "Shooting Stars" at the Berlinale 2002. Dutch-born Tara Elders made her acting debut while still a student at the Amsterdam Academy for Dramatic Arts "De Trap". She was cast in the TV movie "Vroeger bestaat niet meer", after which she played supporting parts in films like: "Mis", "De Val", "Loverboy" and "Boy meets Girl". She also starred in leading roles in the television seriesTV7 and "Najib and Julia". Her recent feature films include "Pipo en de P-P-Parelridder", "Shouf Shouf Habibi", the lead role in box-office hit "Phileine Says Sorry", "Feestje". She is one of the most well-known young actresses in the Netherlands today. With a mother from Norway and a father from Germany, Linda was brought up in both countries. After learning her craft in London and her native Norway, Linda Steinhoff began acting in various short films, musicals, music videos and stage plays ("A Doll's House," "Chicago," "Three Sisters"). She is currently starring in the TV series "Monsterfrog" directed by George C. Francis. Filip Peeters has long been an established presence in the world of Dutch-speaking cinema and television. Born in 1962, the actor was selected as the Flemish delegate for "Shooting Star" at the Berlinale in 2001. In recent years, Filip Peeters has been appearing increasingly in productions shot in other European countries and in America. He has starred in such distinguished films as the Academy Award-nominated features "Iedereen Beroemd" (Everybody Famous) and "Antonia's Line." Recent credits include "The Alzheimer Case", "Leben Wäre Schön" (TV), "Resistance" , "Der Fussfesselmörder" (TV), "Baby", "Der Felsen", "Anna Wunder" etc. Burt Kwouk was born in Manchester in 1930, but left for Shanghai at the age of one. In 1954 he moved back to England and started to work as an actor. He gained international fame through the "Pink Panther" films with Peter Sellars, where he played Kato, the hilarious karate-practicing manservant to the bumbling detective Inspector Clouseau. Many of his acting assignments have called for straight interpretations, notably his roles in such films "Satan Never Sleeps" (1961) and "The Brides of Fu Manchu" (1965). Togo is a highly experienced Japanese actor based in England. In the sixties he trained at the Haiyuza Theatre and Tono Gakuen Drama Collegue. Togo has been recently travelling the world filming "Code 46" (dir. M. Winterbottom) followed by "The Last Samurai" (dir. E. Zwick). Recently he opened in a production of Sondheim's "Pacific Overtures" at the prestigious Donmar Warehouse in London. Besides many stages plays, his numerous film credits include: "Topsy-Turvy (dir. M. Leigh), "The Nine Live Of Thomas Katz" (dir. B. Hopkins), " Eyes Wide Shut" (dir. S. Kubrick), "Felice… Felice (P. Delpeut), "Just Like A Woman" (dir. C. Monger), "Coded Hostile" (dir. D. Dawlow).